Hello I am Emeral (Blue Shadow, Podolski or Offense Core on PO) and I am one of the PO Elites. I have been playing pokemon for two and a half years and I always try to do my best. So if you challenge me, you can be sure that our battle will be awesome. - Dream World abilities not yet released, items that are not yet released or Pokemon that are not yet released are obviously not allowed. 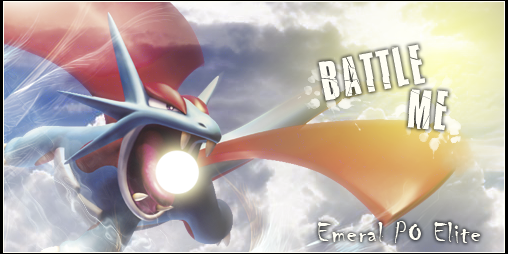 If you want to challenge me, send me a PM on "Smogon University" server stating that you are from BattleStormers. I'm connected on it everyday under the name of: Blue Shadow / Podolski / Offense Core. OMG!! Awesome!! I ABSOLUTELY LOVE THE PICTURE!! I'M AT A LOSS FOR WORDS! !